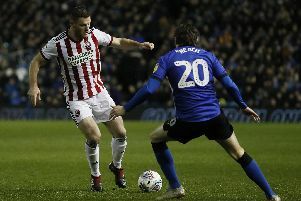 Former Sheffield Wednesday loanee Matty Fryatt has described the agony of attempting to recover from the injury which has forced him to retire from playing at the age of 31. The striker - who scored four goals in nine appearances for Wednesday during the 2013/14 campaign during a two month loan spell from Hull City - said he was leaving the training pitch at Nottingham Forest close to tears due to the pain of an Achilles injury which ultimately spelled the end of his career. Fryatt had not played football since March 2015 when he this week announced his intention to walk away from a playing career. But he has spent much of the time since his last competitive appearance fighting valiantly to return to fitness. “From the March period to May in that [2014-15] season I rested and did nothing, and then went to run again and it was worse," he told The Guardian. " I was coming in off the training pitch nearly crying, hobbling around in absolute agony. I could not run. It was embarrassing." Fryatt underwent several operations in an attempt to fix the problem but said he would be unlikely to go down the same route if he could relive the experience. Such was his struggle that he never even met one Forest boss, Philippe Montanier, due to his time spent in recovery. After leaving Forest in the summer, Fryatt trained with Burton Albion and Walsall but knew he could not come close to reaching the same heights which saw him net 128 goals in 384 competitive career outings. In a statement made on his retirement, Fryatt said: “I have enjoyed over 15 years in the game as a player, but I feel certain that now is the time to begin the next chapter in my life. “I am honoured to have represented six great clubs and to have experienced so many memorable personal and team moments; winning trophies, promotions and playing at Wembley Stadium. “I’d like to thank my friends and family for their support and my teammates, managers and backroom staff for their help and belief in me, and of course the supporters of the clubs I played for who were always fair with me. Fryatt started his career with Walsall and had spells with Carlisle United, Leicester City, Hull City and latterly Nottingham Forest. After joining Forest in the summer of 2014, Fryatt was struck with numerous problems relating to an Achilles injury he suffered while with Hull. Prior to his retirement, he had not played since March 2015 and was without a club after leaving Forest last summer. He hopes to remain within football through media, coaching and scouting.